HCFoo's Tennis Blog – Tennis Celebrity Photos, News, Gossip and More! 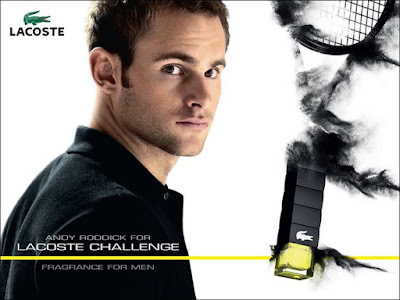 : Do you want to smell like Andy Roddick? Lacoste Challenge fragrance has been around since 2009. Actor Hayden Christensen did an ad for that fragrance first and then last year it was Andy Roddick. What so cool about the fragrance is its bottle that emulates the shape of a tennis racket handle. According to Lacoste website, Challenge combines the immediate punchy vitality of its citrus and ginger aromatics with the depth richness and power of its woody base. A sense of casual elegance, destinated for all metropolitans with a playful spirit, captures the essence of self-assured and adventurous attitude of the modern Lacoste man. If you are interested to get a free sample of Lacoste Challenge, click here. This free sample is not available in all countries though e.g. my country Malaysia.